I saw the dec shocking at the sbh entrance & jut inside the south gap also last Friday. was going to ask what they were getting but was in a hurry to get lines in the water. The DEC has the lake broken down into grids. When doing their creel surveys they ask which area of the lake you were fishing. The windmill grid is the area around the windmills. Each grid is approximately ten square miles. Fished by windmills Monday....picked up 4 walleyes 17 - 23". Cottonwood "snow" lost us at least 2 others crawler harnesses took everything. Things change quickly out there, but I saw very little bait or fish on Myers on Saturday....... fished there for about 2 hours and made our way east. New York State Department of Environmental Conservation (DEC) today announced a meeting to update the public about the status of the Lake Erie and Upper Niagara River Fisheries on June 20, 2018. "This annual event provides an excellent opportunity for anglers to interact with the biologists who study and manage Lake Erie and Niagara River fisheries," said DEC Regional Director Abby Snyder. "Among this year's updates biologists will share exciting new findings from studies exploring movement patterns of walleye, lake trout, and lake sturgeon." The meeting will take place at Woodlawn Beach State Park's Lodge on Wednesday, June 20, from 6:30 to 9:30 p.m., and will begin with an informal discussion and poster exhibits. The meeting will be followed by a series of presentations on Lake Erie and the Upper Niagara River fisheries topics, including an opportunity for angler input on a variety fisheries management activities. The meeting will conclude with questions and an open discussion. Key members of Lake Erie and Niagara River's fisheries management and research community will present on Lake Erie fisheries research, management and assessment activities. This seminar is sponsored by DEC's Lake Erie Fisheries Unit and Region 9 Fisheries offices. Anyone interested is welcome to attend this free event and registration is not required. 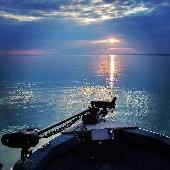 The Lake Erie and the upper Niagara River rank among New York State's top fishing destinations, especially for walleye, smallmouth bass, and steelhead. The 2007 statewide angler survey estimated more than 800,000 angler days spent on these waters and the estimated value of these fisheries exceeded $22 million to the local New York economy. For further information contact Don Einhouse, Lake Erie Unit Leader, (716) 366-0228. Interesting reading. Good to see the DEC using our license dollars to help improve our fishing. The south gap by the lighthouse or Seneca shoal are both good starting points. You can't go wrong with a three way swivel, eight inches of line to a sinker, twelve to eighteen inches of line to a #6 hook, and a good supply of crabs. You'll tear'em up. Good luck. Thanks Locoman... we will give those spots a try. Is there a better place to buy bait than the SBH bait shop? Their prices seem high. Huge day out of buffalo today. Could have had a 12 fish limit in the box by 730 but we were releaseing today just out for fun with dad. Put well over 30 in the boat, awesome morning! Going out tomorrow, debating on Ontario or Erie did you have luck trolling or were you bottom bouncing? I was in the same boat about erie/ontario today. Launched off olcott this aft. Three Salmon. One skip, two about 8lbs. One decent steelhead while letting line out for downrigger. 125-225. Didn't see allot on the graph. Put down right in front and trolled west. Are you custom making these 7 oz bottom bouncers? Get them from a friend who makes them. Decent aftn out behind the windmills. Bottom bouncing 46ft. Finally marked a decent amount of fish. A few guys got into it about fishing close. Man, allot of water and allot of fish out there. No need to crowd each other. It's only a fish. Supposed to be relaxing!